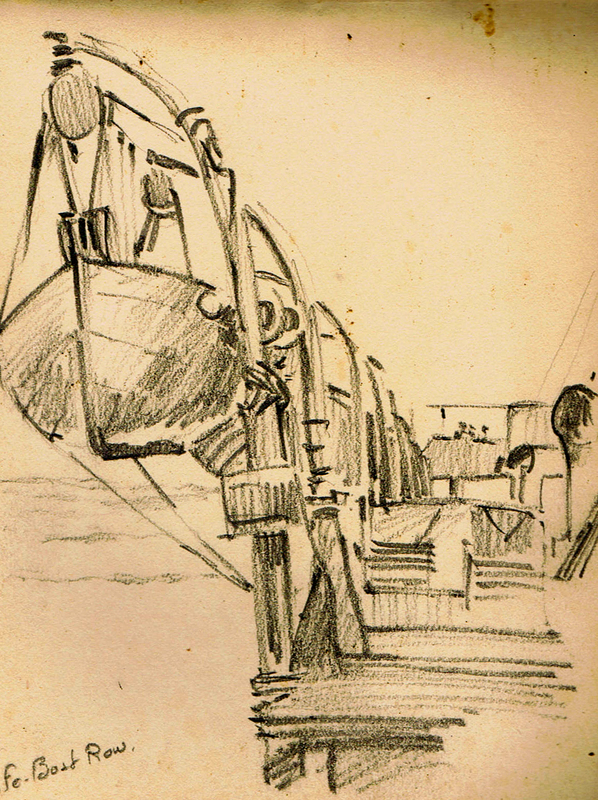 The U.S. was at a huge disadvantage when it came to ships during the First World War. As David Kennedy points out in Over Here, ships were “trumps” and the British controlled most of the cards. The Americans were largely dependent on the British, especially for the transport of men and materiel. The Navy Yard was working overtime to complete its many projects but even with all the extra work they did not finish the Tennessee before the end of the war in November 1918. Note the doughboys in the lower right hand corner. Several years ago when I was still single and people still listened to music on things called compact discs, I occassionaly bought myself a boxed set around my birthday. There were not too many, but sets I did purchase included Charles Mingus’s Complete Atlantic Recordings and Miles Davis’s Complete Live at The Plugged Nickel. Usually I stayed away from such extravagances, because I found boxed sets to be gratuitous and usually stuffed with a fair amount of filler. It tied in neatly with the reissue boom that brought the world full versions of often-truncated original releases. This was especially true when it came to live sets. For instance if a Waylon Jennings concert was originally ninety minutes, the original album might have been whittled down to forty-five for space or commercial reasons. 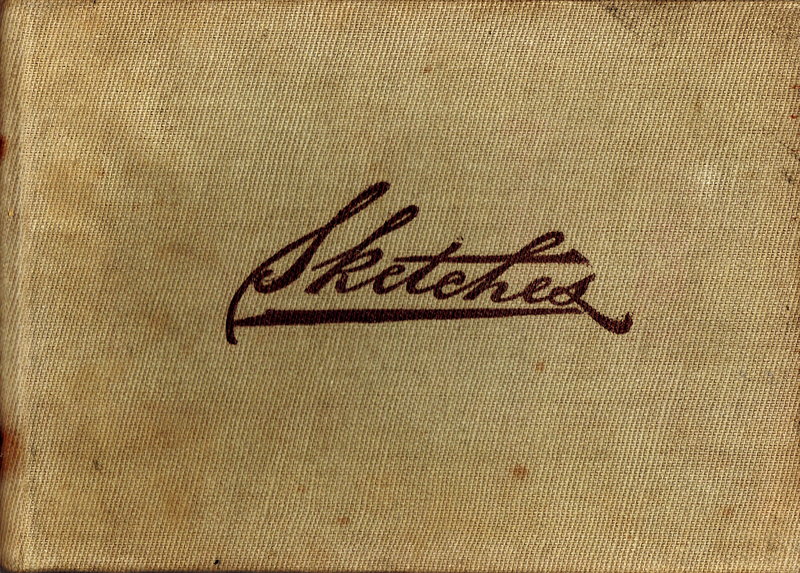 A compact disc allowed for the release of the full, original listening experience. At least that was the ideal. Usually however, cd re-releases were a shameless money grab for labels to get people to buy what they already had. How many reissues of Kind of Blue did the world really need? Almost a decade ago I bought The Carter Family’s In the Shadow of Clinch Mountain, a twelve cd behemoth from Bear Family that was worth every penny. 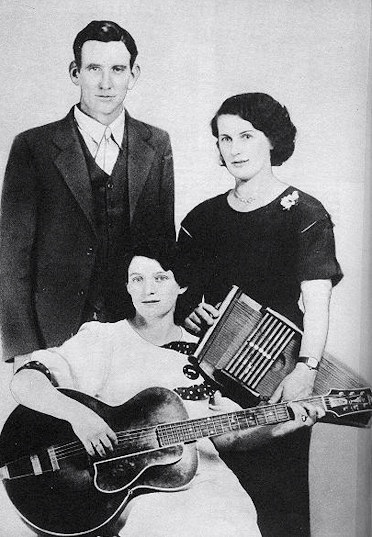 The Carter Family were A.P., wife Sara, and his sister-in-law Maybelle. Their 1927 records for Ralph Peer in Bristol, Tennessee are the foundation of modern country music. What made their sound so immediate was its stress on the vocals and deemphasis of the instrumentation. 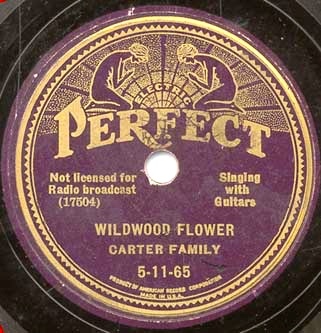 The American recording industry was coming into its own at this time and companies like Victor, for whom Peer worked at the time, were eager to capitalize. That same week in the same place Peer recorded Jimmie Rodgers as well. I have always tended to listen to the earlier years of the collection, which contains over 275 songs and an extended interview with Mother Maybelle. Over the past twelve days I mixed it up and listened to the twelve discs in chronological order. I don’t know how a band can go on and on for decades without recording a bad song, but the three managed to do it. What is even more incredible is that they did it amidst such personal strife and marital chaos. I have always enjoyed the Carter family full oeuvre but I don’t think I fully appreciated it until taking it in in its totality. There is also the fact that as I get closer to fifty I understand the message much better than I did when younger. How much does one know about loss or regret when in one’s twenties? The Carters’ music is so powerful because it looks at the ambiguity and complexity of life so unblinkingly without ever losing its hope and affirmation. I have found it comforting to listen to over this spring. 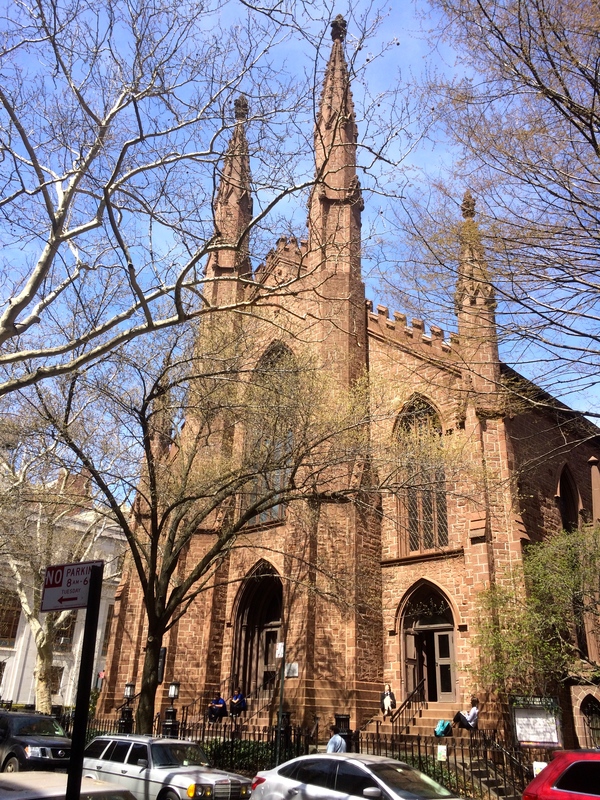 Late last week I was walking though Brooklyn Heights on my way to meet a friend for lunch when I saw that the gates of the First Unitarian Congregational Society Church were open. I love to visit the many places of worship here in New York City, which depending on the era might have been built by Italian craftsmen who came through Ellis Island or were centers of Abolition during the Civil War Era. No, not all of them have such a dramatic provenance but one gets the idea. 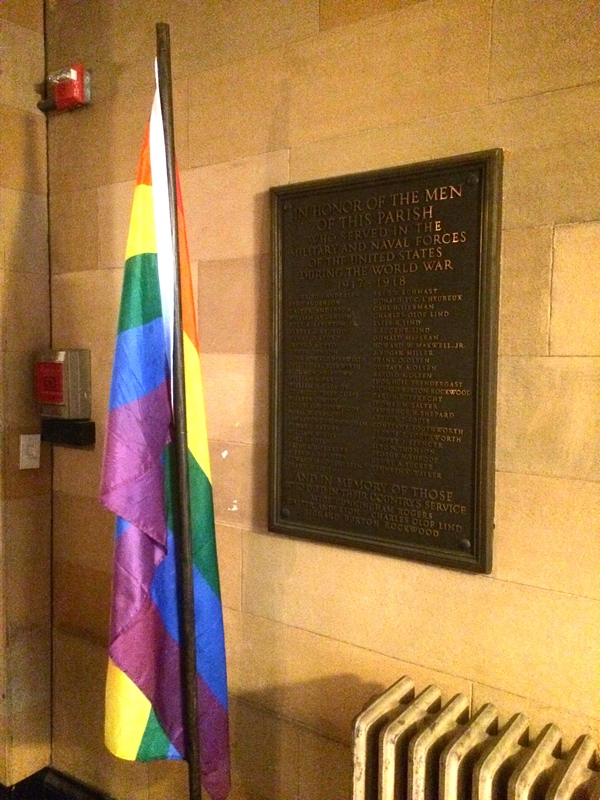 I had never been in the First Unitarian before, though I had walked past it dozens of times. 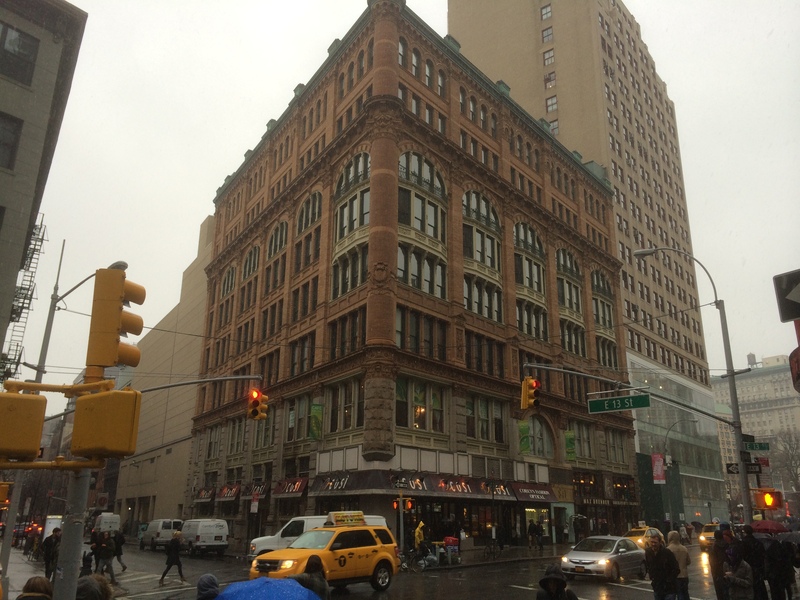 The neo-gothic structure dates to 1844 and carries the years well. 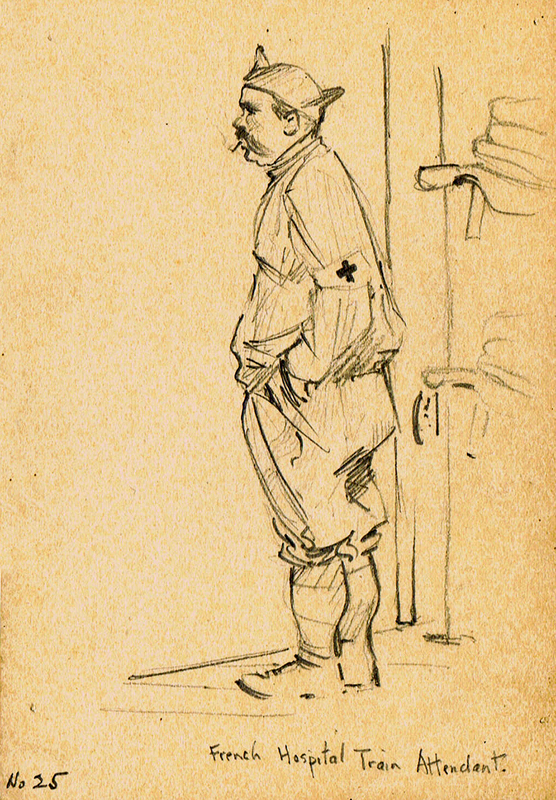 I was only there for all of five minutes when, heading toward the door, I noticed a Great War marker on the wall in the vestibule. Of course I took a few pictures to research and submit to the World War 1 Memorial Inventory Project. The plaque itself was nothing out of the ordinary, nor would one expect it to be. With simple dignity it marked the contributions of those from the the congregation who served in war from 1917-18. A few of them made the ultimate sacrifice. I could not find too much information about when the plaque was dedicated. The church leader though turned out to be an interesting individual. 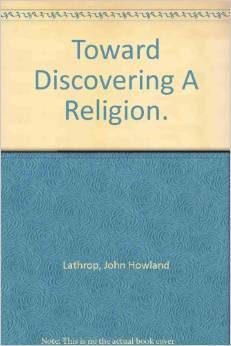 The Reverend Dr. John Howland Lathrop led the First Unitarian from 1911-57. He was against American involvement in the war but when it came in April 1917 he made his own contribution: Lathrop helped bring the Red Cross into the United States Navy. When that initial work was done he led the Red Cross’s WW1 initiative within the Third Naval District. That jurisdiction covered most of the Northeast. He was successful in these endeavors and continued a life of public service until his retirement in the late 1950s. A lot of that work involved cleaning up the mess in Europe that resulted from the chaos and destruction of the Great War. 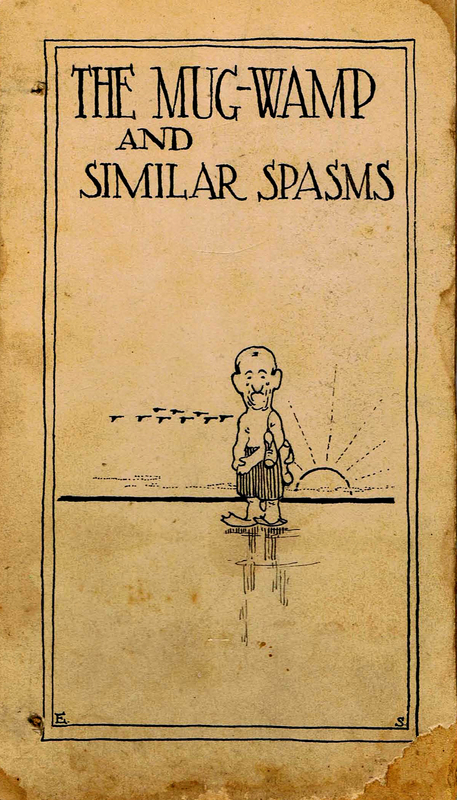 I intend t do a little more with Lathrop in the coming months. 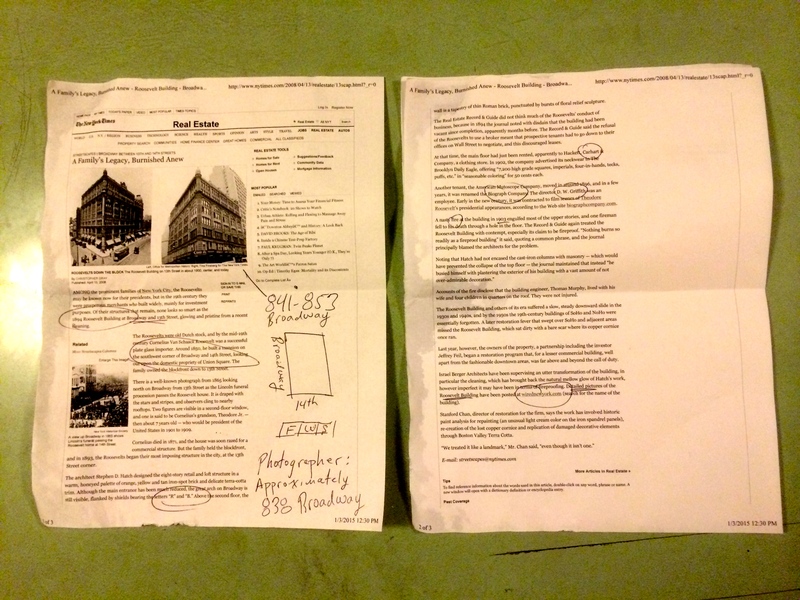 A little digging revealed that his papers are at the Brooklyn Historical Society, which is across the street from the church that he served for nearly half a century. 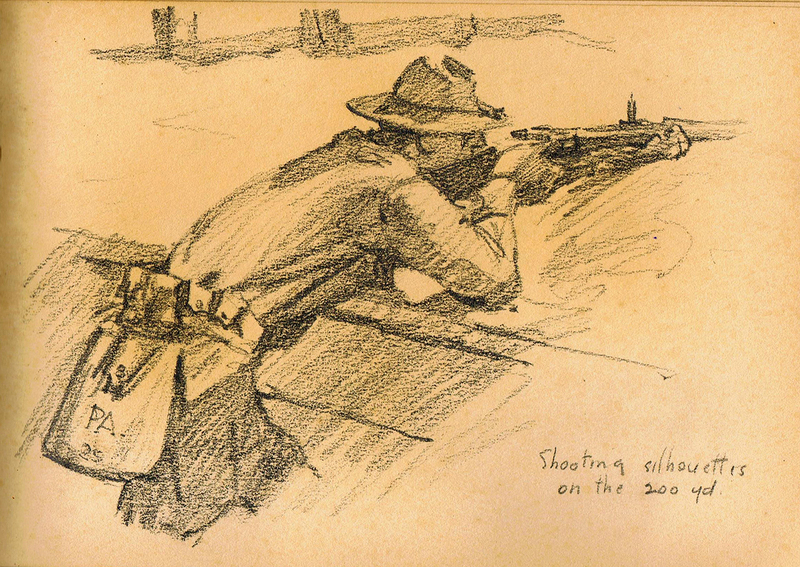 Recently I posted about Rex Passion’s new book The Lost Sketchbooks: A Young Artist in the Great War. Rex has performed a labor of love in preserving the voluminous corpus of work Shenton left behind. A few weeks back I sent Rex the link to an article about The Sketchbook Project, a Brooklyn-based library of 33,000+ sketchbooks from around the world. I believe Rex sent them a copy of his new book for their collection. The visual history of the Civil War–Winslow Homer, Alfred Waud, and their contemporaries–has been so well documented. 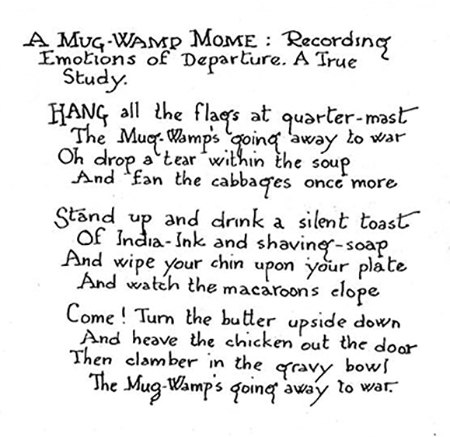 It seems we don’t fully appreciate the visual culture of the First World War to anywhere near the same degree. I am hoping that changes during the Great War Centennial. 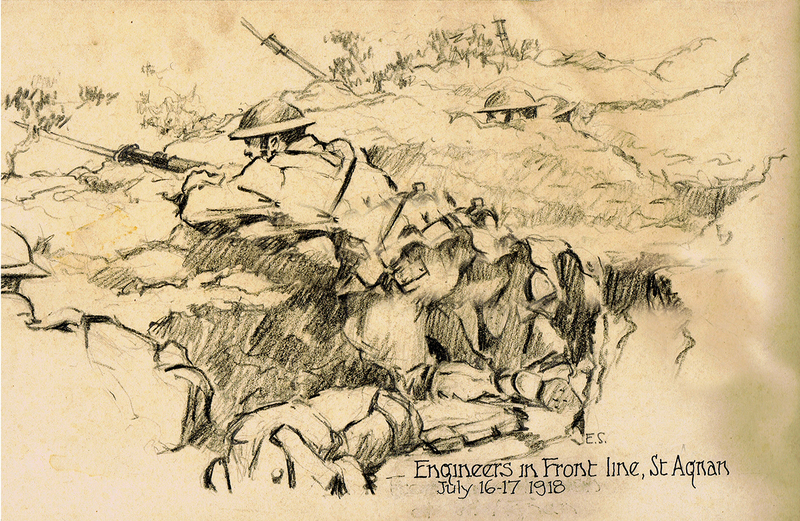 The public needs to know of the work of such solider/artists as Ed Shenton, John W. Thomason and their counterparts from across the globe who lived and fought in the trenches of 1914-18. 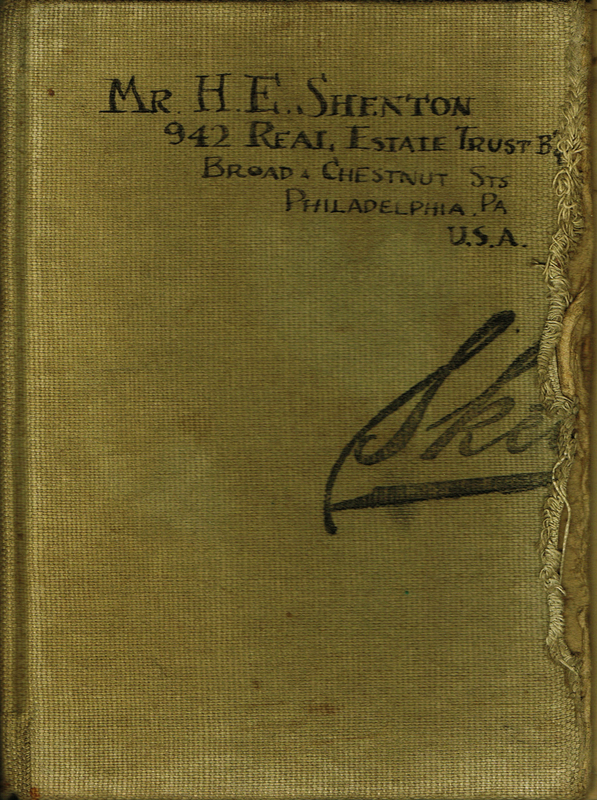 The Strawfoot: Tell us about Edward Shenton and his experience in the First World War. 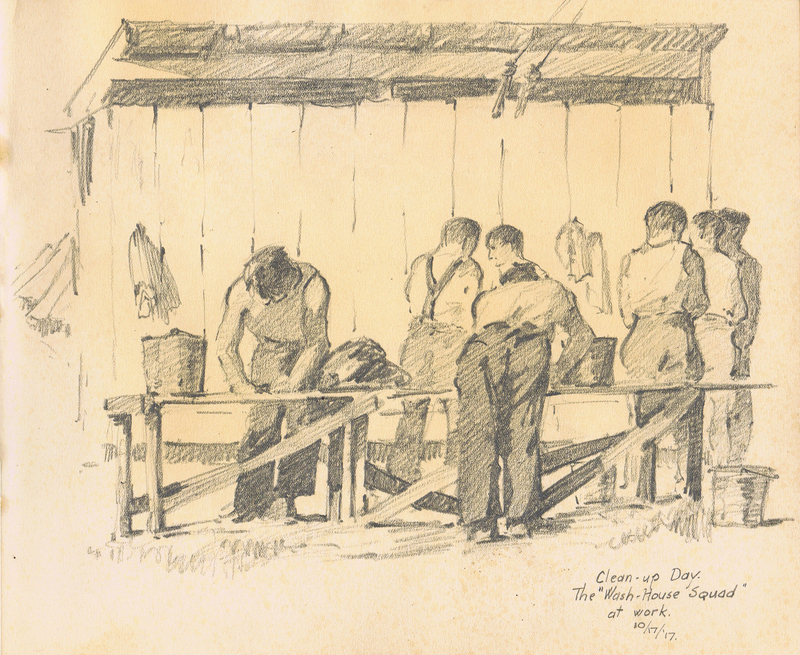 Rex Passion: At the time the U.S. declared war on Germany, Edward Shenton was in his second year as a full-time art student at the Pennsylvania Museum and School of Industrial Art in Philadelphia. He had just gotten through a very trying and depressing winter and the decision to join the army seems to have cleared away some of the dark clouds. 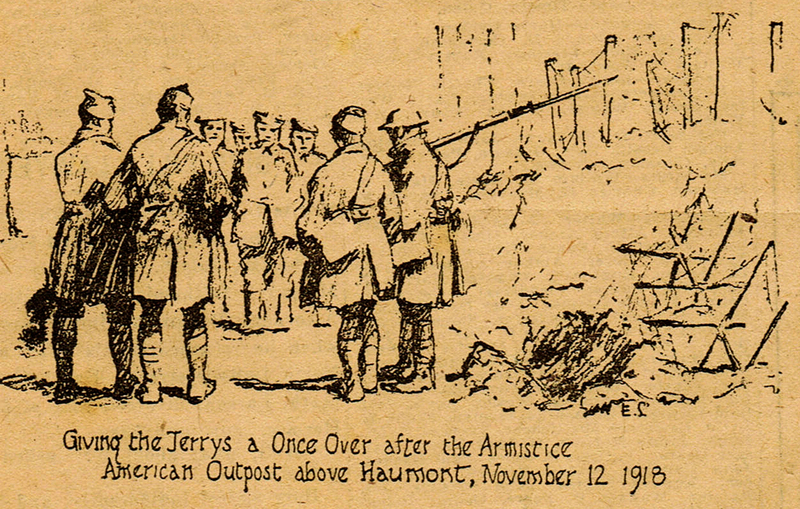 Ed and fifteen of his high-school friends joined the Pennsylvania National Guard at the armory in Philadelphia and Ed was assigned to Company apt, 103rd Engineers, which was later attached to the 28 Division. After several weeks of drill and training at the armory, Company B moved to Camp Meade between Baltimore and Washington. 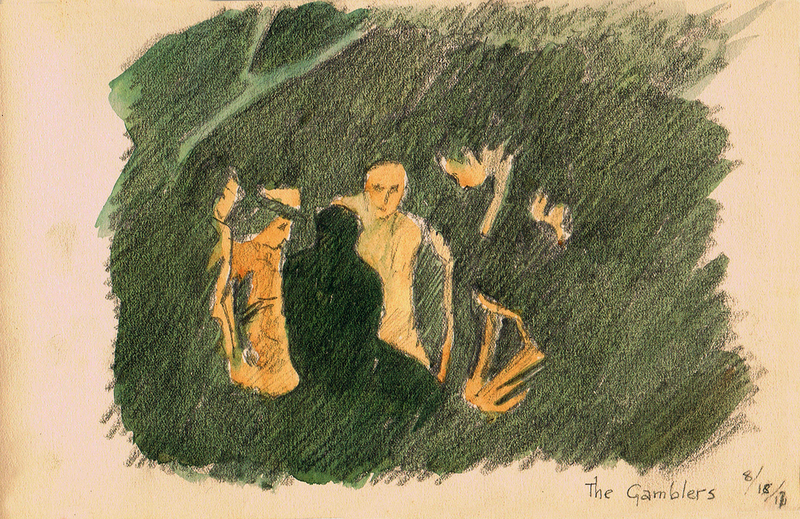 The land for the camp had been purchased by the government only weeks before so Ed was present with his sketchbooks as the camp was being built. 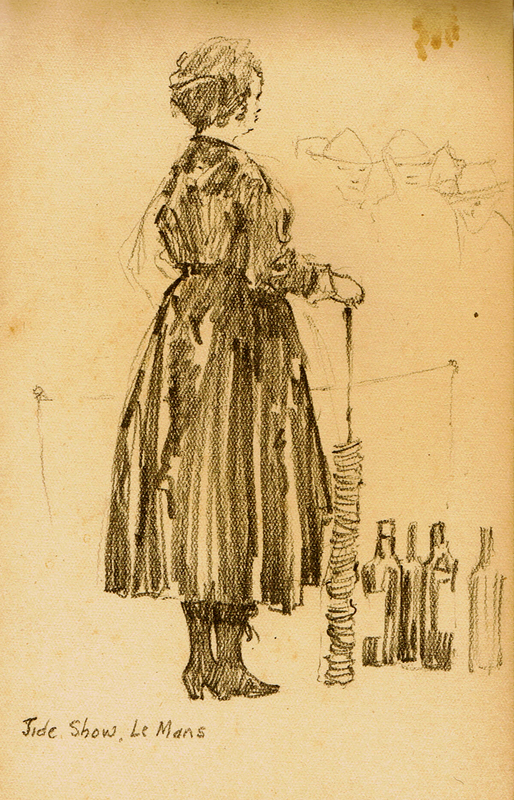 He kept up his art school habit of drawing what he saw every day. 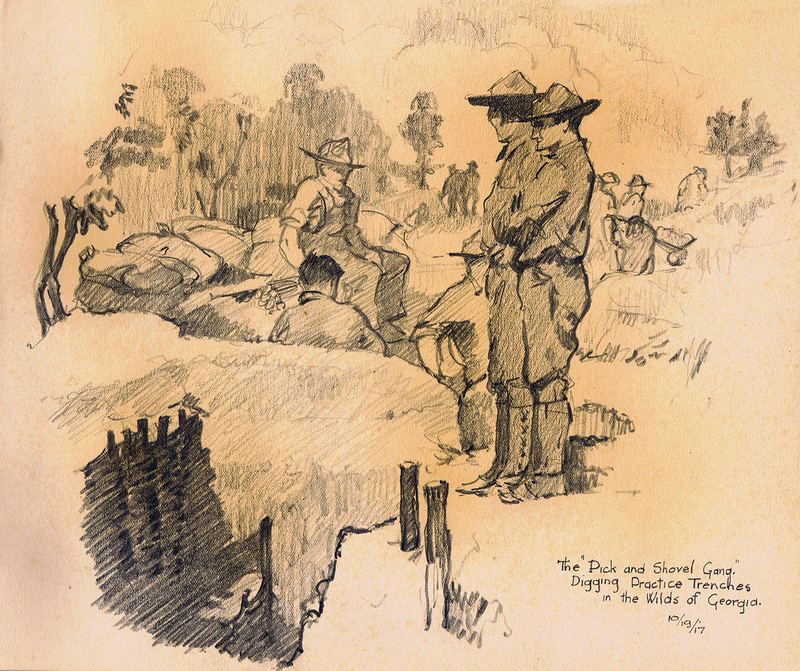 The new recruits spent the spring at Camp Meade then moved to Camp Hancock near Augusta, Georgia where their training intensified. They learned the building and demolition techniques of a combat engineer, but also the craft of an infantry soldier. 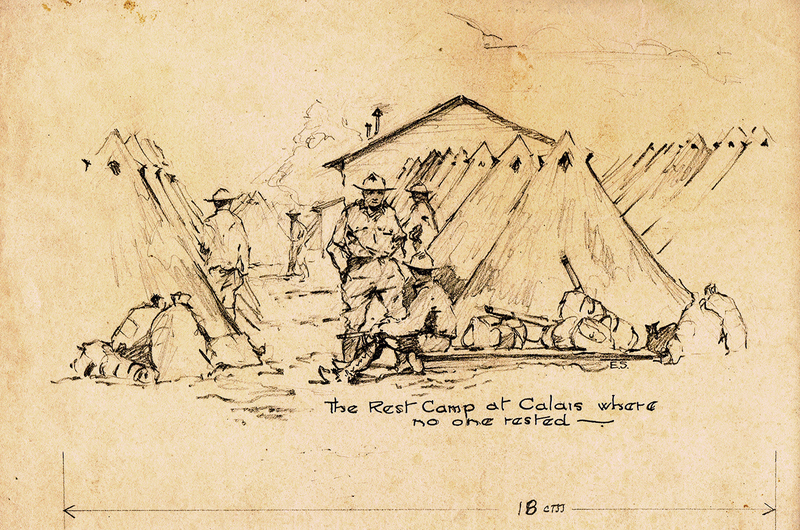 In addition to the soldiers’ training the men of Company B had various camp chores but still found time for a bit of rest and recreation. 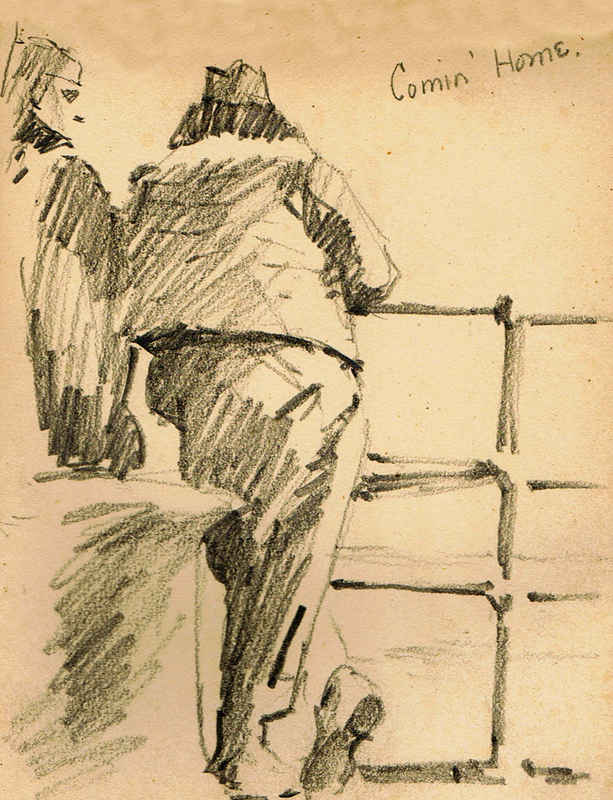 Finally, after nearly a year of training, Ed Shenton and his friends embarked for France and the war. On the first of June they arrived in Calais and after an additional three weeks of training moved toward the front. 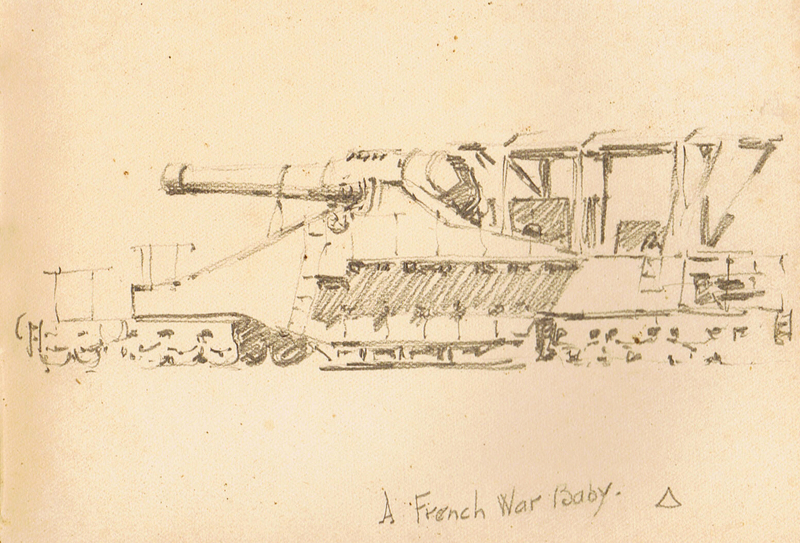 The engineers’ first taste of combat was near the town of Charly-sur-Marne. They lived at a chateau near the river and marched to and from a place called la Canarderie (the duck farm) amid cannon fire and aerial combat. 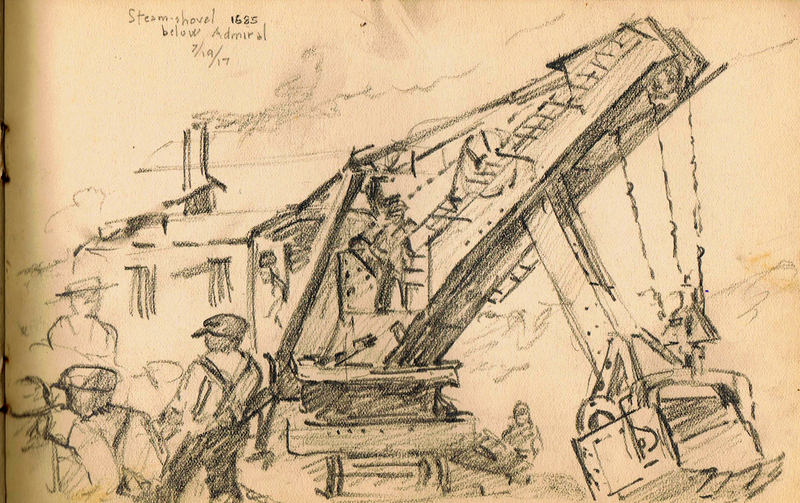 During this period Ed was building trenches all day and only had time to draw after a long days’ work. 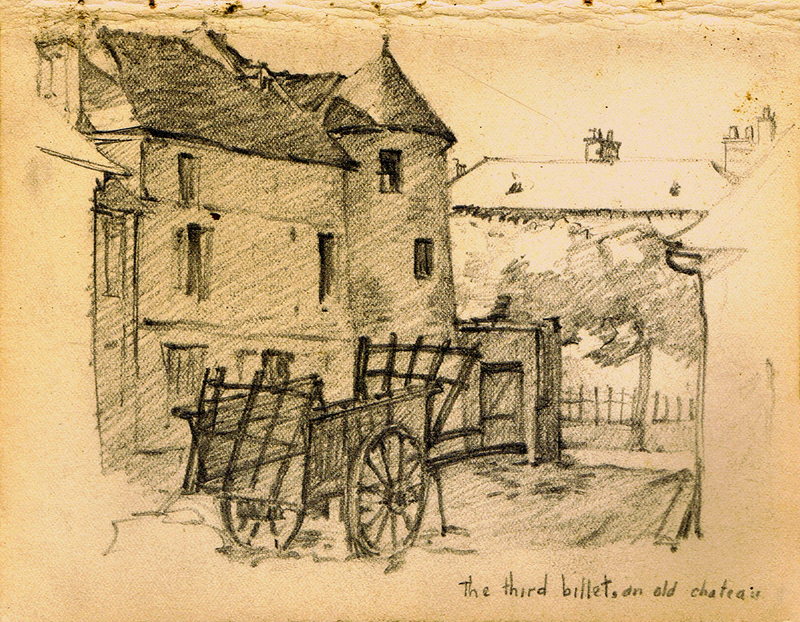 On July 14, the engineers were hastily withdrawn from Charly-sur-Marne and redeployed to the east near the town of Condé-en-Brie. On the night of the 15th they marched to a hillside above the town of St. Agnan and the next morning relieved the 109th Infantry, which had been decimated by the advancing Prussian Guard. 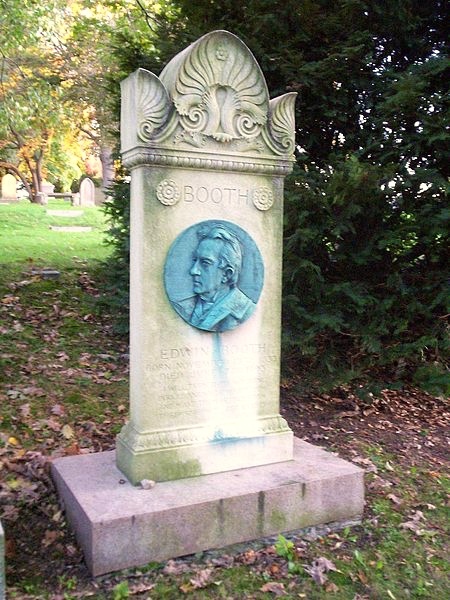 I suppose there will be all sorts of articles about the Booth family online and elsewhere throughout the week. So, I should not have been surprised when I came across this piece about Edwin in yesterday’s Boston Globe. It’s about he and his brothers’ ties to The Hub. As nineteenth century actors the Booths were nomads. It is not surprising they had ties to many locales. The accompanying photos include a picture of John F. Fitzgerald, John F. Kennedy’s grandfather, paying his respects at Booth’s grave. 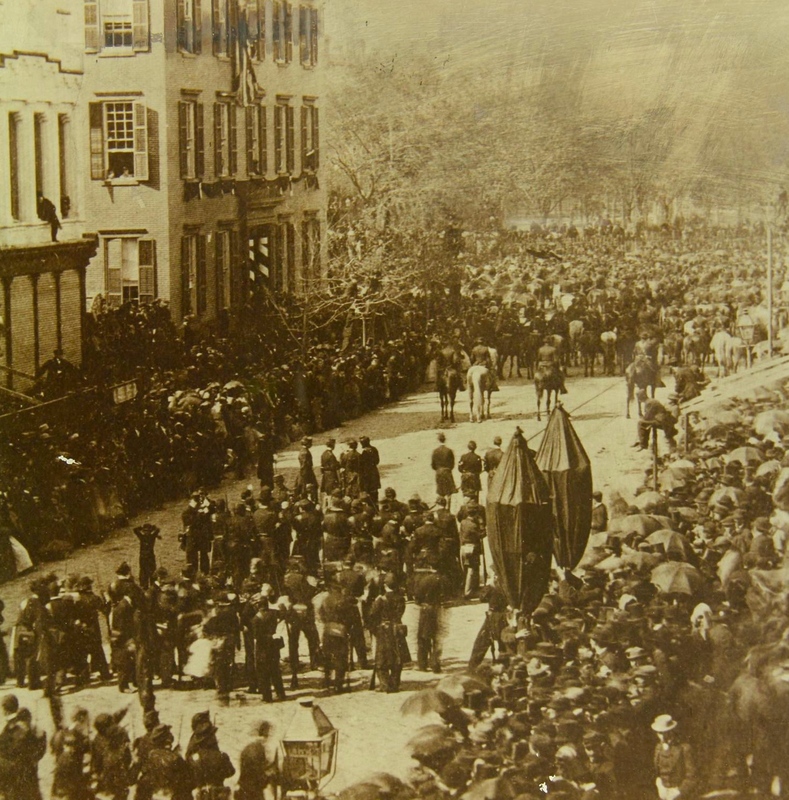 I had an idea for an interpretive program for the TRB to be held in Union Square on the anniversary of the Lincoln funeral procession passing the Roosevelt household on 14th Street. For unfortunate reasons outside of my control that did not come to pass. 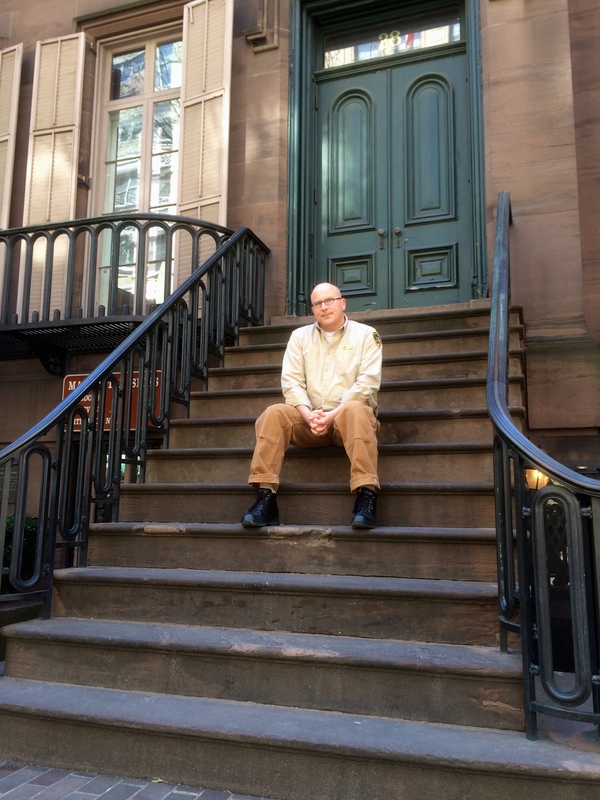 We really were fortunate to visit his Gramercy Park home last week on the anniversary of Appomattox. We were speculating that night where Edwin was buried, and guessed it was either in New York or Baltimore. I knew it was not Green-Wood Cemetery because, well, that’s something I would have known. As it turns out, he rests today on Boston’s Mount Auburn Cemetery. Crazily, at the exact moment of his 1893 funeral a terrible accident at Ford’s Theater in Washington killed several people. It was something straight out of a Shakespearean tragedy. 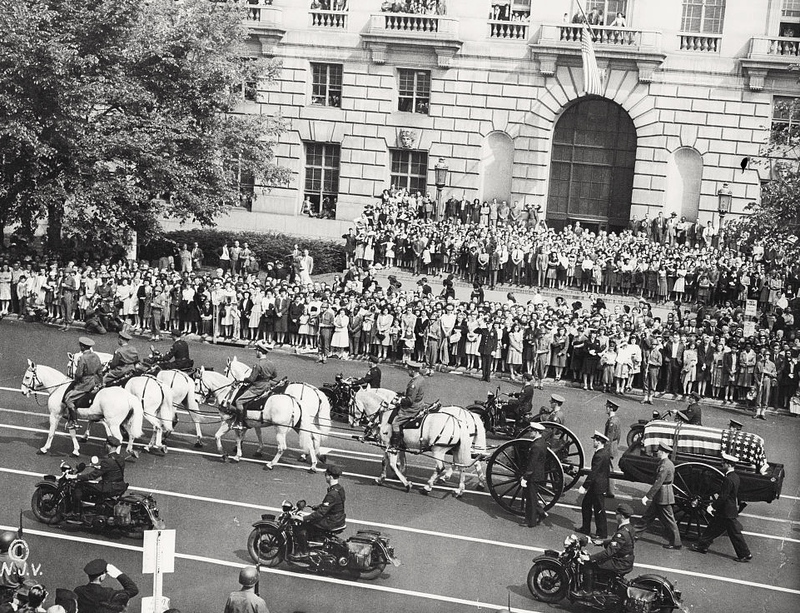 Eighty Aprils after Lincoln’s funeral Americans mourned the death of Franklin Delano Roosevelt. Note the bloom on the trees in the upper left hand corner. Doing my tours at the Theodore Roosevelt Birthplace yesterday I did not fail to mention that April 12–today–marks the 70th anniversary of Franklin Roosevelt’s passing. It was not until I began volunteering at the TRB that I realized how intertwined the two sides of the family were, and indeed remain today. 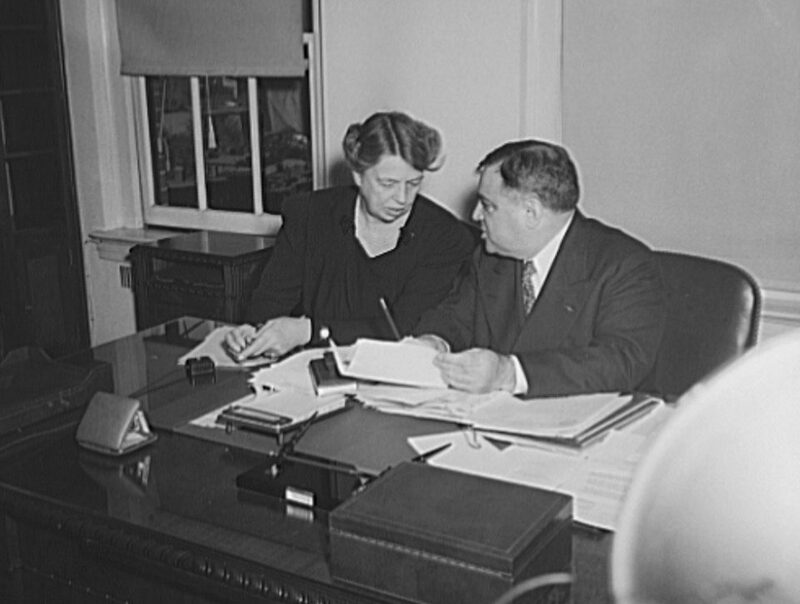 To give one example: when Franklin was himself assistant secretary of the navy, in the Wilson Administration, he and Eleanor rented a Dupont Circle house from Anna Roosevelt Cowles. Mrs. Cowles was Theodore’s older sister and Eleanor’s aunt. Throughout much of World War One, Theodore himself used to drop in to that N Street home to discuss preparedness and how the war was going. 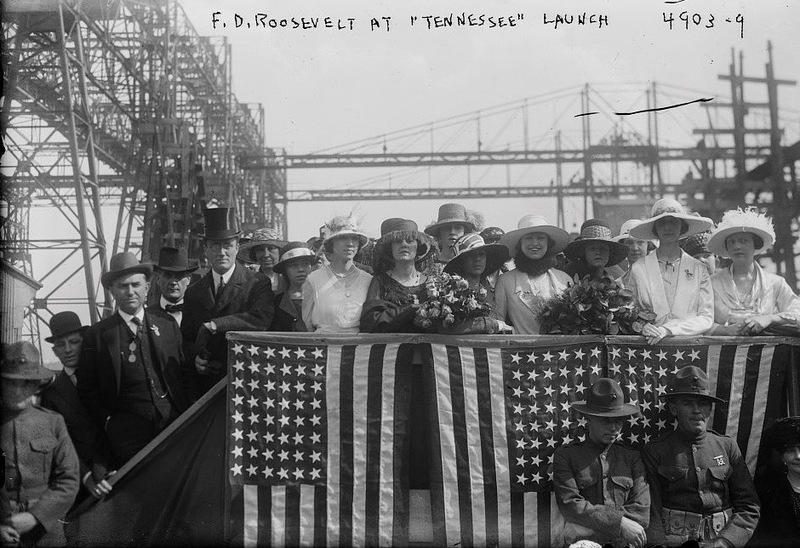 FDR learned much in Washington from 1913-1921 that served him well as commander-in-chief thirty years later. 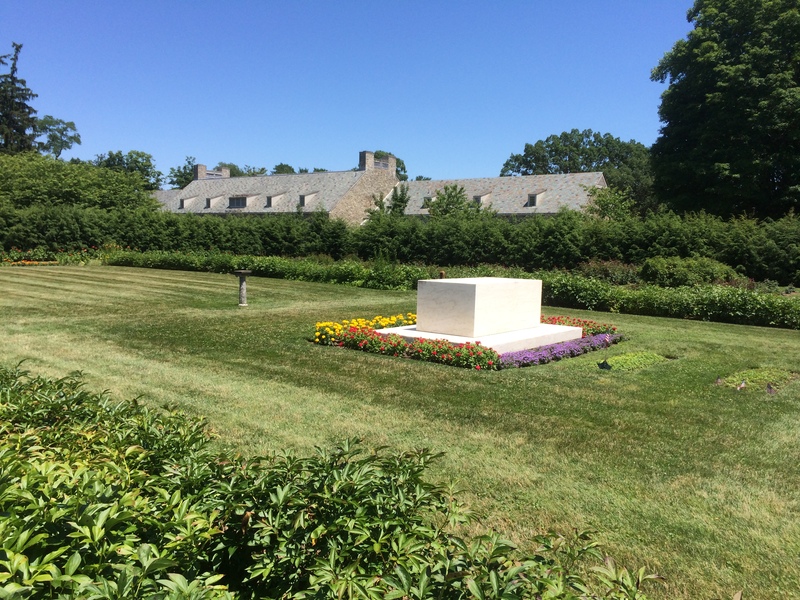 Franklin and Eleanor Roosevelt’s final resting place, Hyde Park, New York. 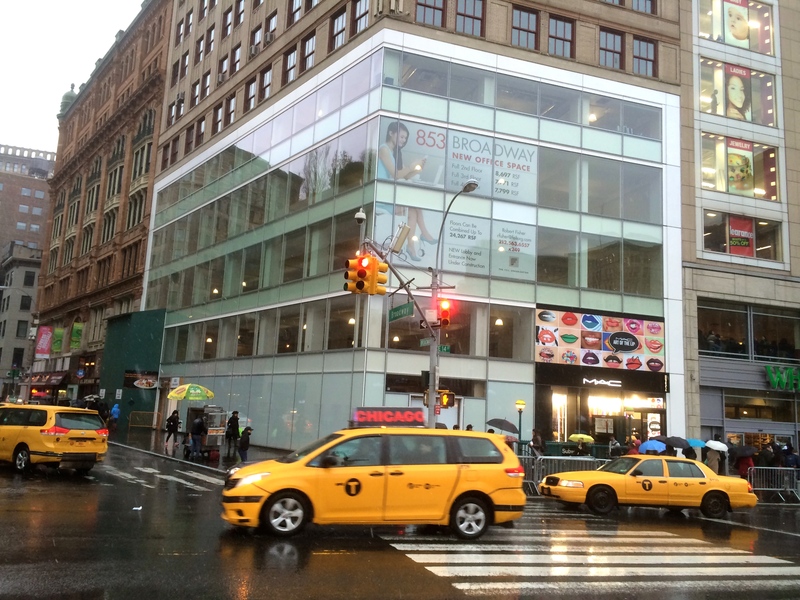 The Roosevelt Library and Museum are in the background. One thing I always mention is how young many of the Roosevelts were when they died. Theodore Roosevelt Sr. was 46 and his wife Martha Bullock just 48. Their son Elliott, Eleanor’s father, was all of 34 when his demons finally caught up with him. Elliott’s son Hall had just turned 50 when his own difficult life came to an end in 1941. Theodore Roosevelt was a mere 60. Then there was FDR himself. All presidents age while in office but Franklin Delano Roosevelt looked considerably older than his 63 years when, after months of failing health, he succumbed to a cerebral hemorrhage at his Warm Springs, Georgia retreat seventy years ago today. 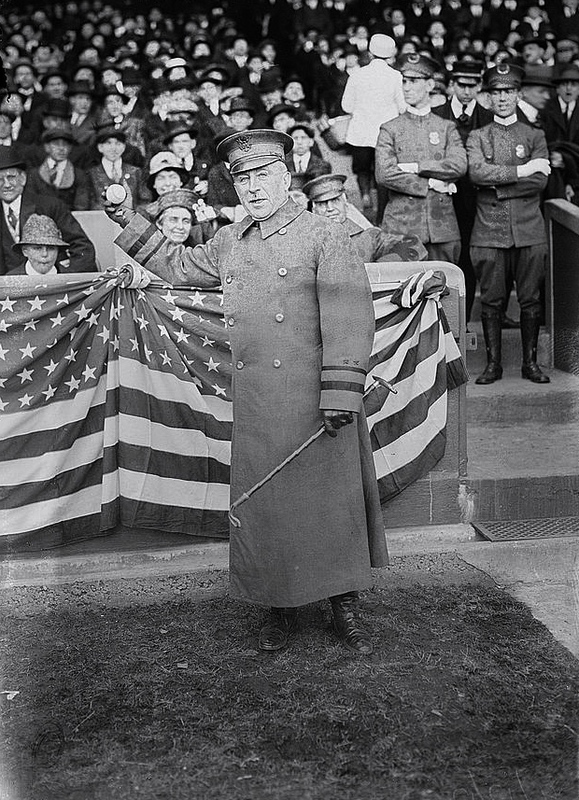 Major General Leonard Wood had just been relieved of command on Governors Island when he tossed out the Yankees first pitch on April 11, 1917. It is not everyday you see an image that captures a precise moment in the history of the New York Yankees, Boston Red Sox, Governors Island, and the beginning of American involvement in the First World War all rolled into one These two images however do just that. The two photographs you see here were taken at the Polo Grounds on April 11, 1917, ninety-eight years ago today. The occasion was Opening Day for the Yankees at the Polo Grounds in Upper Manhattan. Congress had declared war on Germany five days earlier. What is so dramatic about these images is lost on us today. In contrast, the 16,000 in attendance would have grasped the significance of Wood’s very public appearance quite clearly. President Wilson had notified Major General Wood that he was being relieved of command of the Department of the East on Governors Island three weeks previously, on March 24 to be exact. Wood had annoyed the Wilson Administration for much of the past three years with his calls for preparedness; by one estimate he had given as many as one hundred speeches advocating that cause since the war began in 1914. Finally Wilson had enough. To get rid of Wood, the War Department split the Department of the East into three jurisdictions. They gave Wood a choice of where he wanted to go, and he surprised them by choosing Charleston, South Carolina. His final day on Governors Island would be April 30, when he would turn command over to J. Franklin Bell. 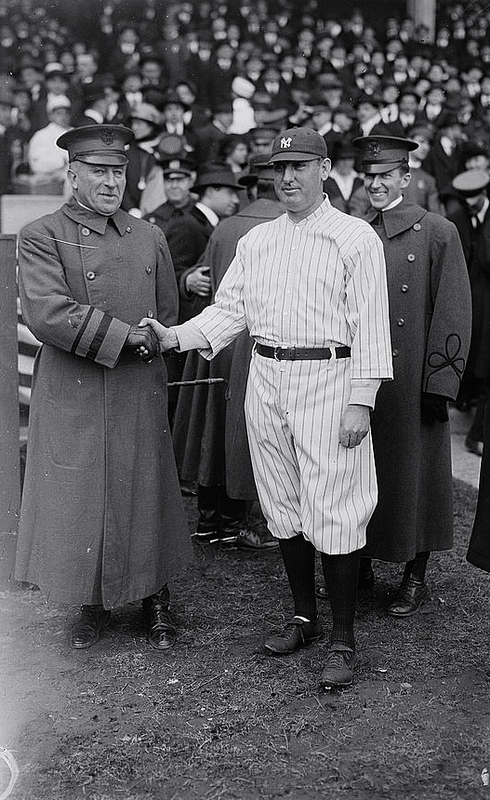 Wood poses with Yankee skipper “Wild Bill” Donovan. The Yankees were not yet THE YANKEES. A few years later they would acquire Ruth and move to the Bronx into the stadium he would help make possible. Wood’s demotion was unpopular in many circles. Supporters invited him to speak or appear at numerous venues between the demotion (March 24) and his departure from New York City (April 30). In what can only be interpreted as a dig at Wilson, Wood was invited to toss out the first pitch that season. The Yankee players even put on a military drill before the game. Babe Ruth was the starting pitcher for the Red Sox. He won the game 10-3, going the full nine innings and scoring a run.